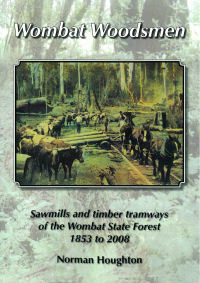 The foundations of large scale commercial sawmilling in Victoria were laid in the Wombat Forest from 1853. This forest was the testing ground for ideas and attitudes to the harvesting, transport and sawing techniques that forged resource management and sawmilling management styles well into the 20th century. The discovery of gold throughout Victoria from 1851 onwards led to the opening of numerous mining sites and the mining centres of central Victoria were to require an enormous supply of timber and the eucalypt trees of the Wombat Forest were ideally placed to supply that need.